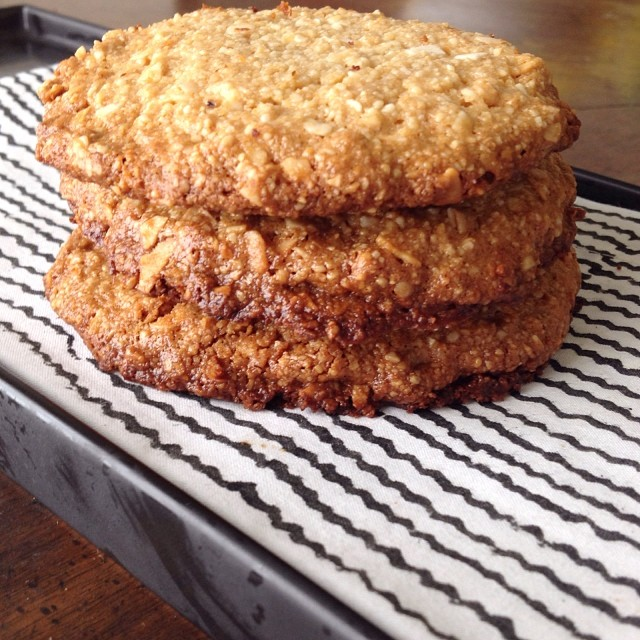 Coconut & Cashew Quick Cookies! I was home last night in the post-rain haze thinking that it would be nice to have a warm cookie to turn Los Angeles into a bit more of a fuzzy and inving place; I am so glad my taste for something crunchy and gooey paid off! 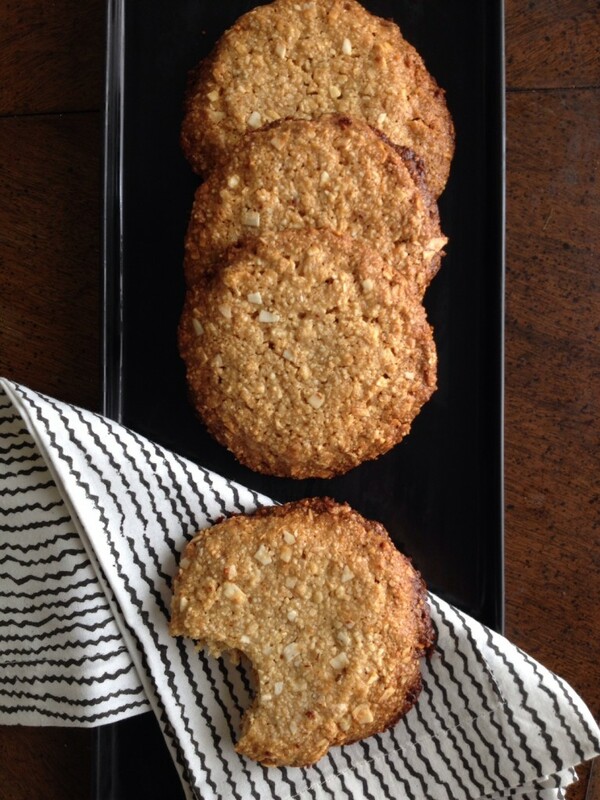 These coconut cashew cookies are suitable for breakfast (and least for me! ), they are egg, flour and refined sugar-free and if you have about 5 minutes (plus 15 or 20 to bake them, and at least an hour to leat them cool) you are in for a treat! A cross between an oatmeal cookie and a granola bar, but much more substantial to chew, these last-minute cookies do not disappoint! I adapted this recipe from Laurie Boone’s amazing book “Powerful Plant-Based Superfoods”. Her’s were Vanilla Almond Coconut Cookie and I am sure they are amazing as well. Everything in her book is fantastic, plus it will teach you so much about the superpowered foods that are becoming increasingly more popular because they are life-changing! Coconut is one of those superfoods, providing a high dose of healthy fats and fiber, and in the case of the coconut oil, it may actually help to fight bad bacteria in your digestive system. Plus, it is delicious! 1/4 cup of coconut oil. You can use grapeseed oil or even light (non-extra-virgin) olive oil. I mixed it all up in a bowl. It starts out crumbly and starts to stick together. I collected tablespoon-sized scoops and formed them into golf-balls of dough, then flattened them onto a non-stick cookie sheet. Bake them at 325 for 15-20 minutes. Note: YOU HAVE TO WATCH THEM! The bottoms get very dark very fast. They will look a bit golden but almost uncooked when they are ready… A tiny bit firmed up but still soft. Do not overbake or you’ll scorch them. I let them cool for about a hour and a half and as they cool they somewhat magically “firm up” into chewy cookies. If you try to move them before they cool, you ‘ll have very delicious (but very crumbly) granola! These sound AMAZING. I have been obsessed with coconut as of late – great post! OMG! Dana, these sounds amazing! I even think I could get my husband to eat them, as long as I don’t tell him they are “healthy/gluten free” LOL Now, if I can find the cashew meal, would prefer not to have to go all the way to the center of town to Trader Joes… Definitely, pinning these for later. I may see if it works with whole cashews in a processor after the last comment! These look great. Do you think I can use maybe 1 1/2 cups of raw cashews and combine with coconut in food processor until flour consistency? Then and honey and oil. Bought so many cashews on sale last week would love to use them for these great looking cookies. Just made these cookies using 1 1/4 cup raw cashews, 1 cup coconut, 1/4 cup coconut oil, 1/4 honey, vanilla. I processed the cashews and coconut until fine grind. Not so much that it would turn into a butter. Followed the rest of your instructions. I did bake on top rack of oven for 10 minutes. The bottoms were starting to brown and the tops were very pale. So like lots of gluten free vegan cookies I turned the oven onto broil for 1 minute. Came out golden brown. Taste great. Thanks for the recipe. Next time I think I may omit most of the oil and add 1/4 cup of hemp seed. YAY!!!!! & wow- hemp seed?! I am so curious about that one!!! Do you let them cool for an hour and half on the cookie sheet or on a cooling rack? I’ve seen many paleo cookie recipes where they want you to leave them on the cookie sheet, so I just wanted to double check! Great distinction that I should add in above: cool on the baking sheet. When hot I tried to move one and it broke into a zillion pieces! But they cool into chewy awesomeness on the baking sheet! Wondering if I use shredded coconut and then grind it up finer in my food processor, should it measure 1C before grinding or after? Any suggestions for what I could use in place of honey? I have stevia, xylitol and erythritol. I am just not sure how to make up for the liquid part the honey provides to the cookies. I am relatively new to baking with sugar substitutes and I just follow recipes until I learn a little more about substituting. Lucie mentioned hemp seed instead of honey. Do you grind it up or use it whole? Has anyone tried making these on parchment paper or a silpat? I wondered if it would keep them from scorching? These sound great. I’m addicted to TJs cashew flour at the moment as my son needs a low phenol diet and cashew is lower than almond. Are they crumbly when you bite them? I don’t want 3.5yo making a huge mess at school. Thank you! These are incredible! I need to add a step…they spread way out while cooking (at least mine did) so don’t place close together! I used Organic raw honey and Organic Coconut oil maybe that’s what caused them to spread out more…still awesome treats! Just made these- worked really well. Had to sub in veg oil instead of coconut oil-bout still tasted v good. Have diabetic celiac child so always good to find low carb sweet tasting recipe – so THANKS! oh i’m so happy to hear!!! I made these cookies with a little liquid stevia and used unsweetened applesauce to get it to the 1/4cup, they turned out great! Previous post: An Idea To Help You Live A Truly Prosperous Life! Next post: Love Is The Easy Part!